Japancore ‘zine reviewed the CB’s side of this as a scary mix of early WRETCHED and FEAR OF GOD, probably no example could match better. Back to the home recordings at Michele’s practice-room (with a couple new skills), CB reach a step forward in filthiness and negativity. The songs here are ways faster and grind-oriented than the previous split 7″ with Social Genocide and can be seen as a follow-up to the split with Patareni/”Life’s built on thoughts” sessions rather than to the CB’s punky edge. 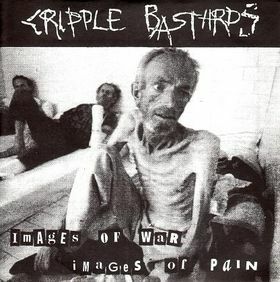 This split includes the very first versions of “Italia di merda”, “1974”, “Images of war / Images of pain”, songs that gradually became some of the most popular anthems among CB fans. The first time we played in Czech Republic (1998) we found out there were hundreds kids begging for “Italia di merda”! Front cover photo shows a man reduced to hunger and degradation in the lager-camp of Silo, where Serb citizens were confined. > released in 1994, no cat. # mentioned, 1500 (or more?) copies made on different pressings, no colored wax – first 300 had a slightly worse sound and were including a yellow flyer giving skills on how to set the stereo equalizer for a better listening. Further represses were made out of a different master and sounded a bit more pumped on the bass frequencie. The ep was re-printed at least 3 times. doing this, i often weep and laugh desperately. i call this practice “repertory”.